Cookies. These can put a smile, and maybe a few crumbs, on anyone’s face. These sugary treats are delicious, but they aren’t exactly known to be nutritious. In this day and age of nutrition labels and calorie counting smartphone apps, these gooey goodies might make you feel a little guilty. But cookies don’t need to be a guilty pleasure any longer. 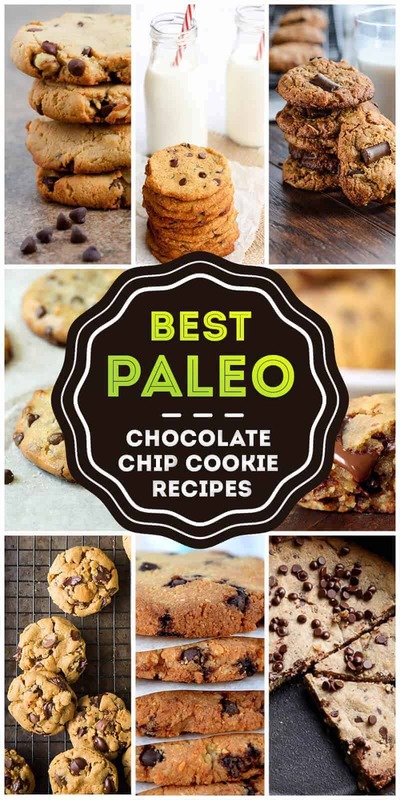 We’ve scoured the internet to find the very best paleo chocolate chip cookie recipes. 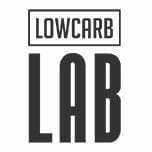 Paleo diets offer a better alternative by cutting out unnecessary simple sugars and carbs and relying more on healthy fats and protein to keep you going throughout the day. Paleo also adds relief to allergy sufferers and sensitive stomachs. Whether you are looking out for nut allergies and gluten restrictions or merely watching your waistline, we have something for you. Here are 50 recipes that are not only good, but also good for you. It’s a veritable treasure trove of treats! 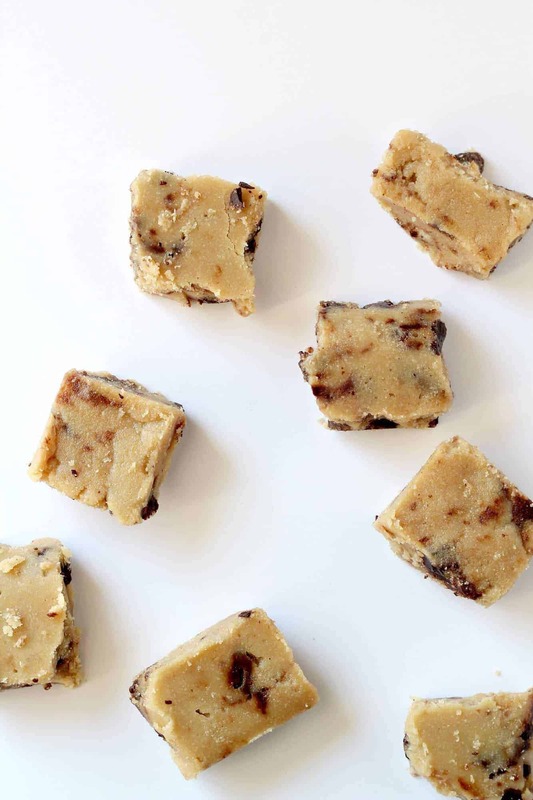 You’ll go nuts over these caveman confections! 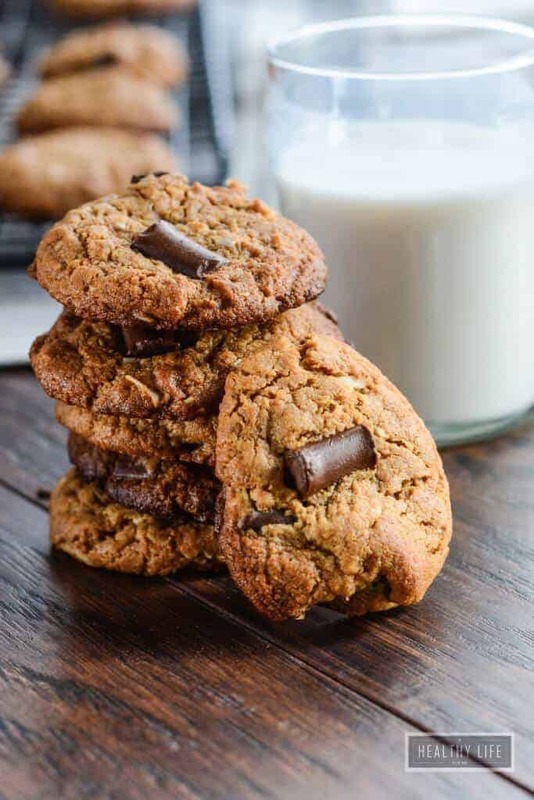 Infused with walnuts to give them that extra protein kick, these paleo chocolate chip cookies offer a tasty alternative to their traditional counterparts. Dark chocolate is packed with antioxidants, making this not only the healthy choice, but the tasty one as well. They’re easy to make and your kids will love them! You might even sneak a few yourself when they’re not looking. But don’t worry, I won’t tell if you don’t. A fun way to add some extra vegetables to your diet. 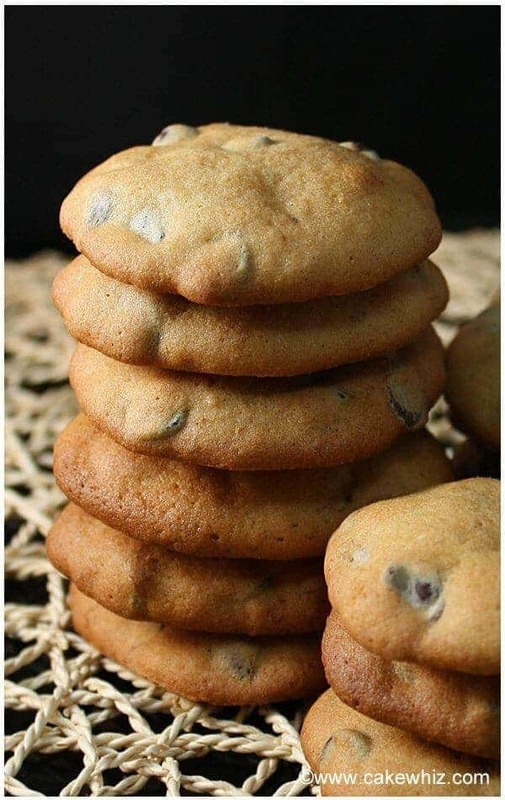 This paleo chocolate chip cookie recipe combines the normal with the unique. 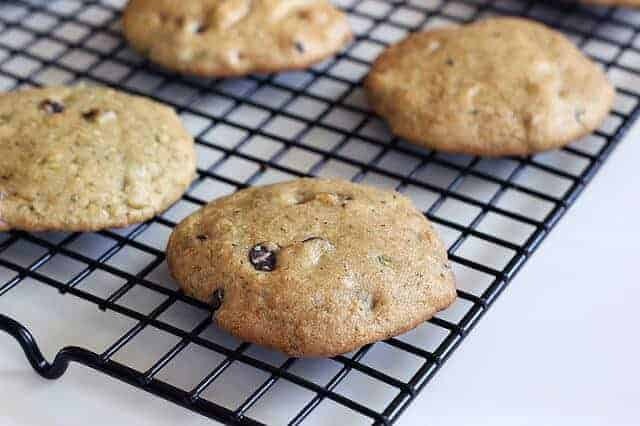 Zucchini makes for an excellent filler for this moist, soft cookie, adding a subtle flavor while at the same time pitching in a few extra grams of fiber. The vegetable is low in calories and is even known to promote weight loss. A delicious and healthy addition to any paleo diet. 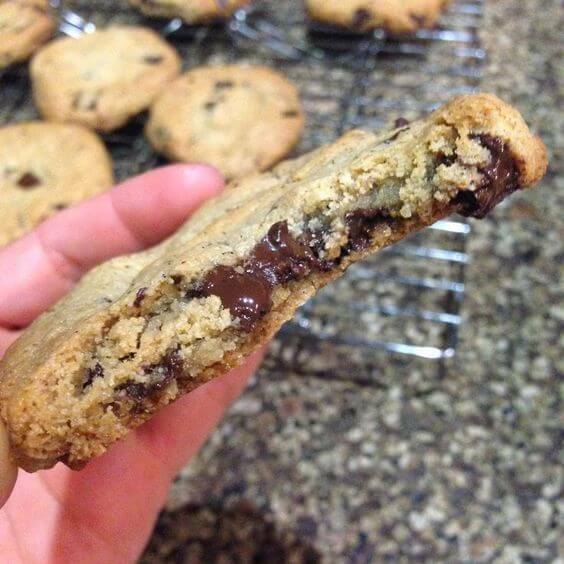 A paleo chocolate chip cookie recipe that rivals Nestle’s own. Giving up gluten and trying to reduce your sugar intake can sometimes take the sweetness out of life. This tried and true recipe proves that going paleo doesn’t have to be the sacrifice you might expect. Substituting in heart-healthy honey helps you live the sweet life once again. Bring on the Toll House challenge! This simple 6 ingredient paleo cookie recipe is easy to make and delicious. The ample supplies of almond butter and raw honey form a powerful one-two health punch. The butter is loaded with beneficial monounsaturated fats, and both are packed with antioxidants. Raw honey can even help against pesky seasonal allergies. 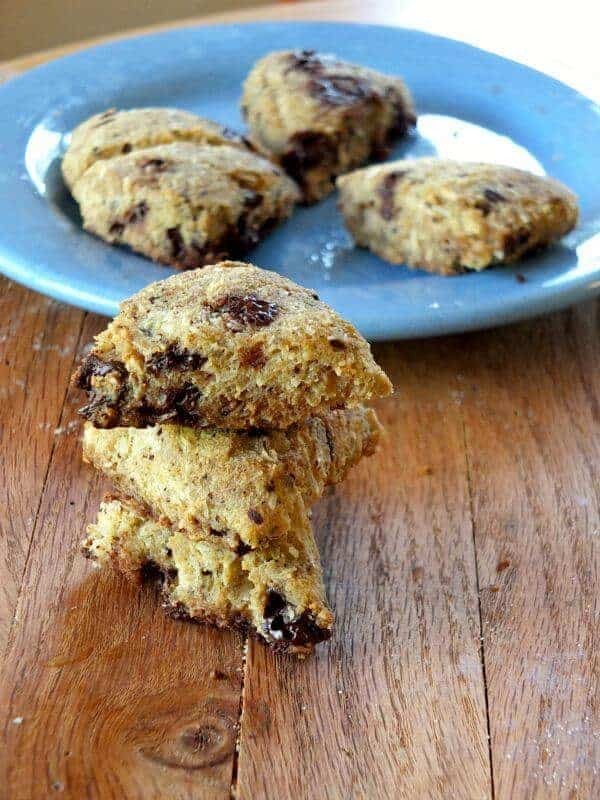 These paleo chocolate chip cookies are completely flour free. Simple. Healthy. Extraordinary. One cookie to fool them all! 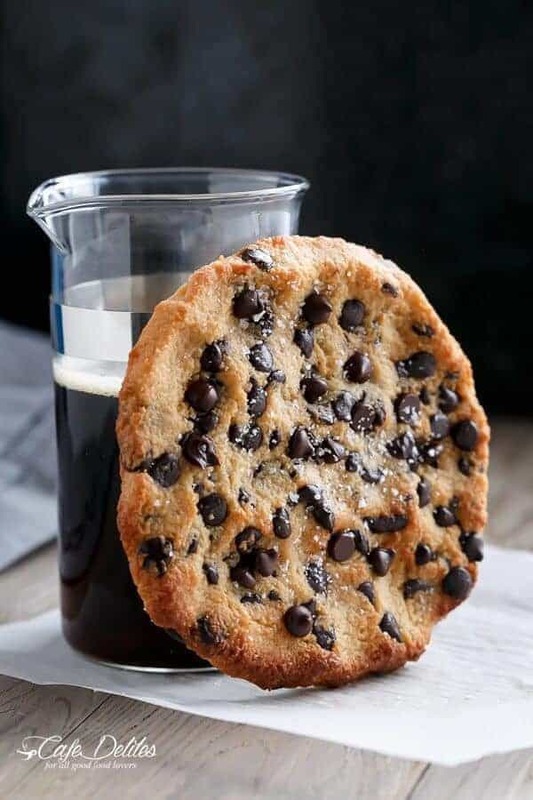 Share this paleo chocolate chip cookie with your friends and they won’t even know they’re eating healthy until you tell them. This is the one to silence all the paleo diet skeptics. These cookies are sweetened with organic maple syrup and a healthy dash of cinnamon. Both have powerful anti-inflammatory properties. The cookies are soft and chewy, and they just might earn a few converts when you let your friends in on the big secret. Macadamia mania! 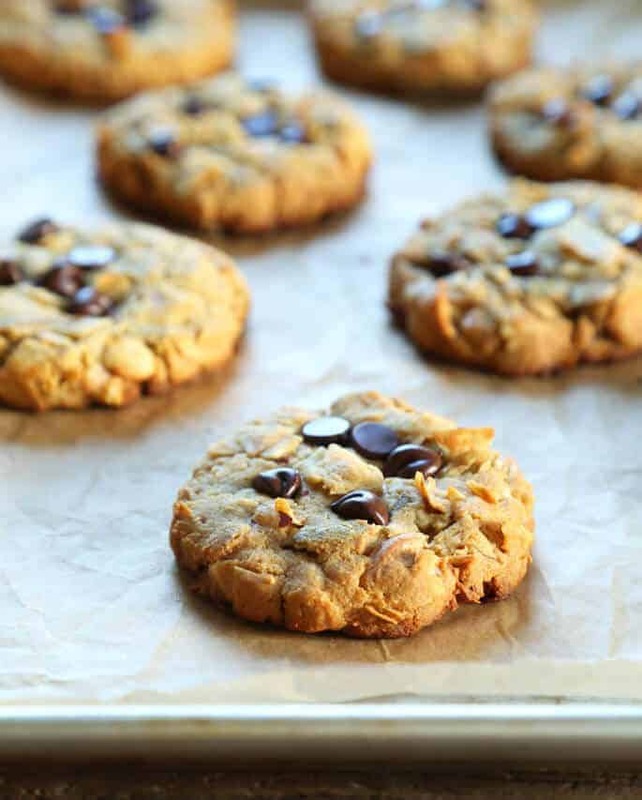 The perfect paleo cookie recipe for anyone out there with peanut allergies. 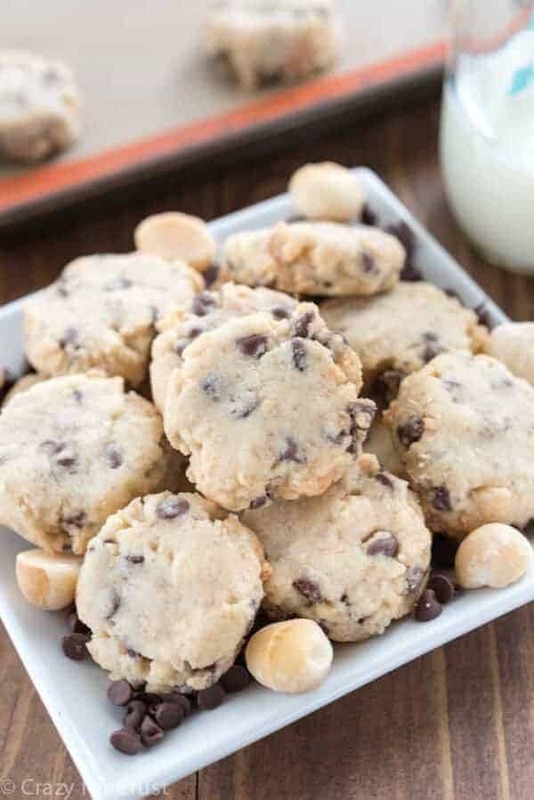 Macadamia nut butter makes a more-than-fair alternative, giving these cookies a unique flavor. Macadamia nuts can help raise good cholesterol levels and they are filled with protein and fiber. The body of the cookie is comprised of coconut flour and flavored with a dash of vanilla. This funny sounding nut butter can put a fun twist on any paleo diet. Do you love cookies? Would you date one? Well these cookies will date you! These delectable caramel paleo chocolate chip cookies are free of flour and rich in flavor, aided by Medjool dates. These naturally sweet fruits mean that no extra sugar needs to be added, and they cook down to release a wonder caramel flavor. Throw a little sea salt on top and it is perfection. Dates are high in fiber and rich in potassium. They fill you up while helping to maintain healthy blood pressure levels. No eggs? No nuts? No starch? No seeds? No problem! These tasty paleo cookies are AIP compliant. Anyone with heavy allergy restrictions knows that auto-immune paleo diets can leave you with few flavorful options. These cookies change all that. They have the standard coconut flour base, but a surprise ingredient is thrown in. Gelatin! This adds a level of springiness to the cookie that gives it the correct mouth feel. To round out the flavor profile, maple syrup serves as the sweetener and homemade chocolate chips finish it out. Coconut flour is a protein powerhouse filled with healthy fats and beneficial fiber. To top it off, this gluten free staple is pretty darn tasty too. 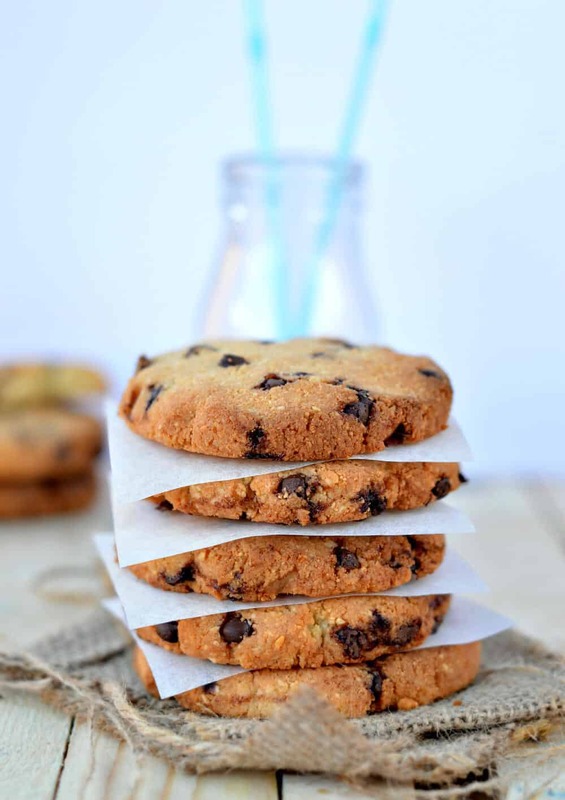 These coconut flour paleo chocolate chip cookies are dairy, egg and refine sugar free. Busy little bees help make these cookies what they. Golden honey is used as a sugar substitute. 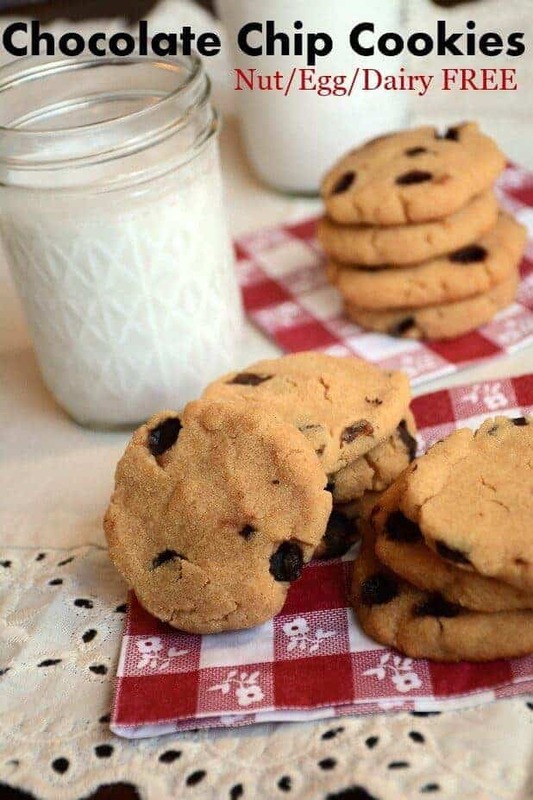 These cookies are chewy, so be sure to wash them down with a glass of your favorite milk. The best part of making cookies is licking the spoon, so why bake when you can just have a bowl of delicious dough instead? This no bake paleo cookie recipe is perfect for those of you that want the rewards without all the work. Just gather these quality ingredients, mix them together and then start handing out spoons. No eggs mean no salmonella means no risk. This cookie dough is both worry and gluten free. Chocolate chips not good enough for you? 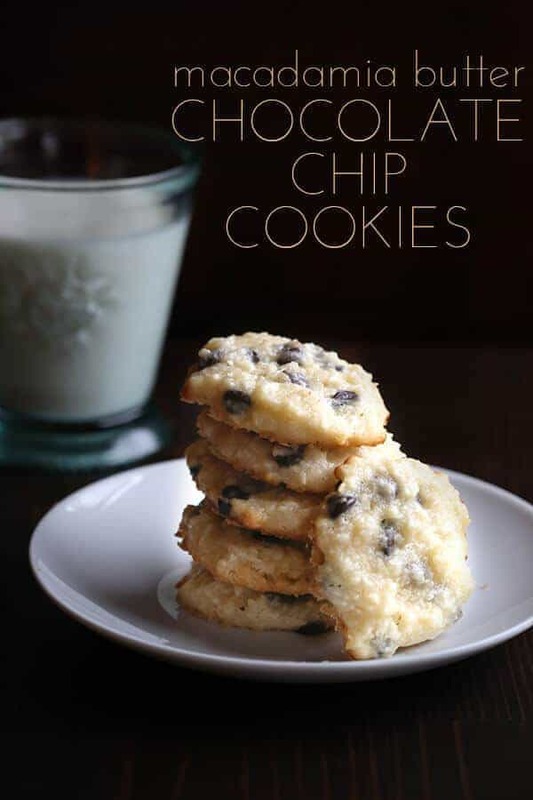 Kick your cookies up a notch with thick chocolate chunks! These cookies feature a cashew butter base with a flavorful shredded coconut mixer. Cashew butter is filled with heart-healthy magnesium, which is great for maintaining stable blood pressure. 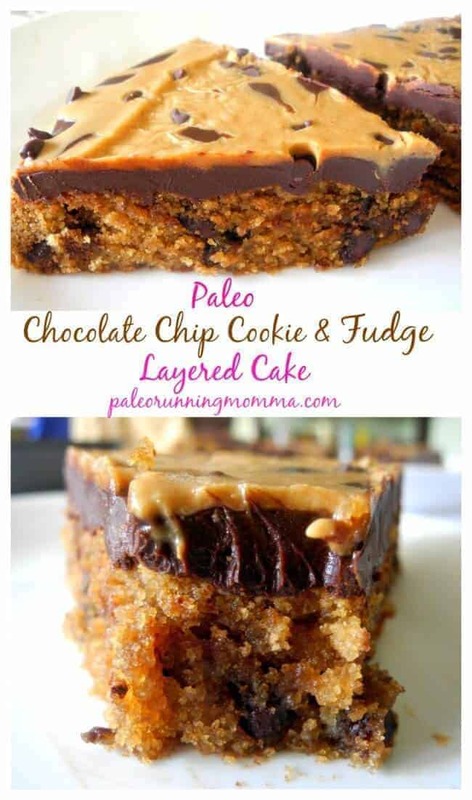 These chunky cookies will not only help your heart, they will melt your heart as well, proving once again how delicious paleo foods can be. Sugar free is the way to be! 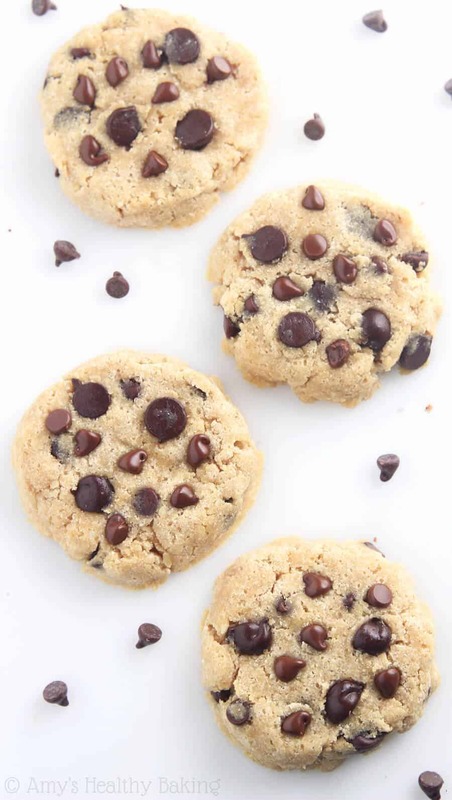 This paleo chocolate chip cookie recipe uses sugar-free chocolate chips and stevia powder. It’s a great cookie for those out there who really want to keep an eye on their daily sugar intake. These cookies compact very well due to their coconut powder base. Add in a handful of cashew chunks, or your favorite nut for that matter, and it makes this good cookie even better. They store well, so whip up a batch on Sunday and enjoy them all week long. Chickpea cookies! This paleo cookie recipe has a delightful, yet unusual base. Chickpeas have a low glycemic index, and the protein and fiber content will keep you feeling full all day long. These versatile peas soak up their surrounding flavors, so you won’t even be able to tell they are there. These cookies are flavored with a mixture of peanut butter and honey. Fresh out of the oven, they have a crispy outer layer, but the inside is all soft, gushy goodness. It’s like biting into a warm ball of dough. In other words, Heaven. If you’re a chocolate lover on the hunt for great paleo chocolate chip cookie recipes, then this is the one for you! Double the chocolate. Double the love. 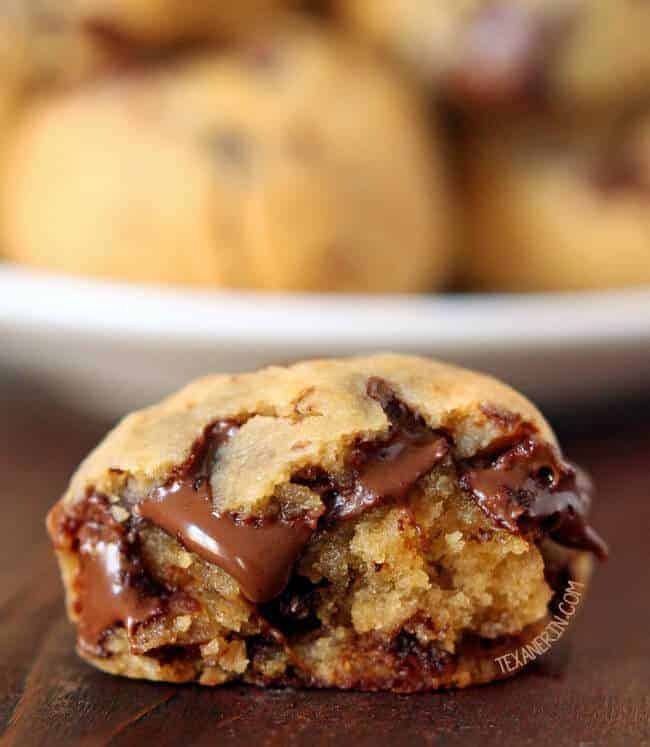 This tag-team chocolate powder/chocolate chip cookie bakes up soft and chewy. Dark chocolate is well-known to aid in the release of oxytocin. This feel-good brain chemical makes for feel-good cookies. You will literally love this recipe. It’s science! Chocolate covered cookie dough! What’s not to like?! Turn off the oven and ready your mixing bowls, this simple paleo cookie recipe is no-bake. It’s also no egg, and therefore no salmonella. It’s perfectly safe to eat raw. It features an almond butter base and is sweetened with maple syrup and a dash of vanilla. Drizzled with chocolate, you can eat them right away, or if allowed to cool, it forms a hard shell of flavor. A cookie dough ball that pops in your mouth. Is it a pizza? Is it a cookie? No! It’s a paleo pizookie! 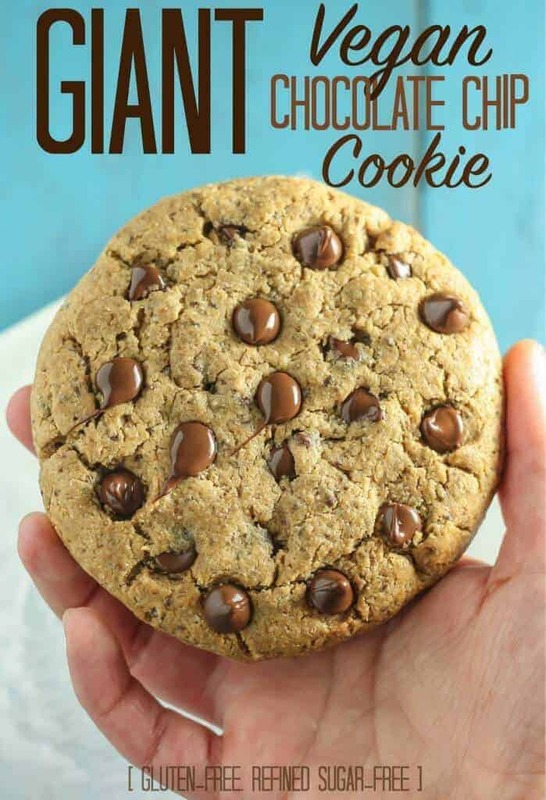 This overly large cookie is the perfect treat to share with friends. The large skillet used makes for a great center piece. The thick cookie has a nice chewy middle, while the edges give a very satisfying crunch. It goes great with a dollop of sugar free ice cream, so grab your friends, grab a slice and go a la mode. Looking for deep flavor? 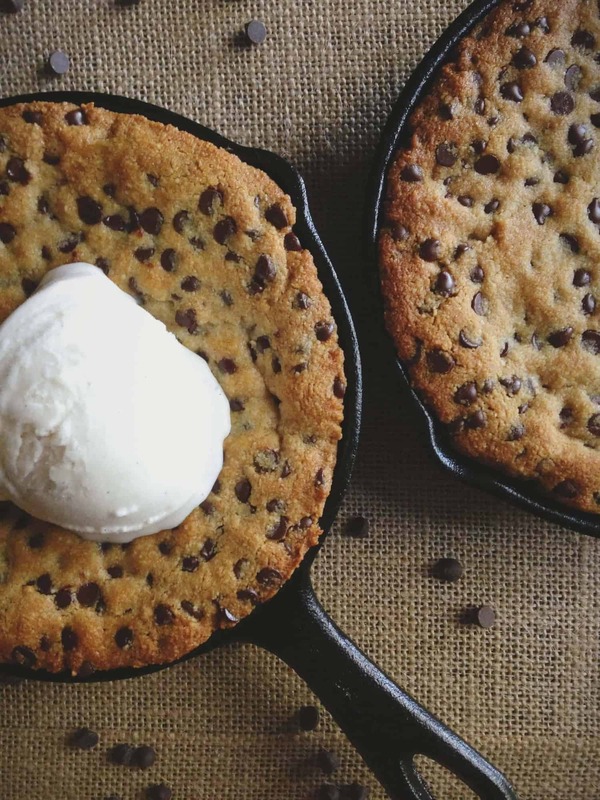 Then check out this deep dish cookie. This single-serving recipe is great for the lone gunners out there, or double it up and invite a friend. It’s made with natural butter, which is filled with healthy fats, and sweetened with stevia. 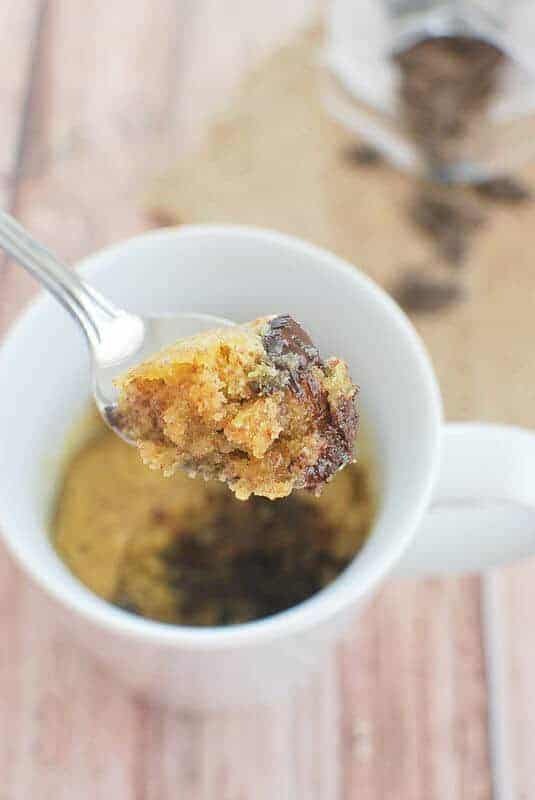 Almond flour makes up the base and adds a complex flavor to this simple paleo recipe. A scoop of sugar free ice cream creates a delightful mix of hot and cold. So gather up the ingredients then just cram it in your ramekin! With paleo foods like these, going gluten free is easy! 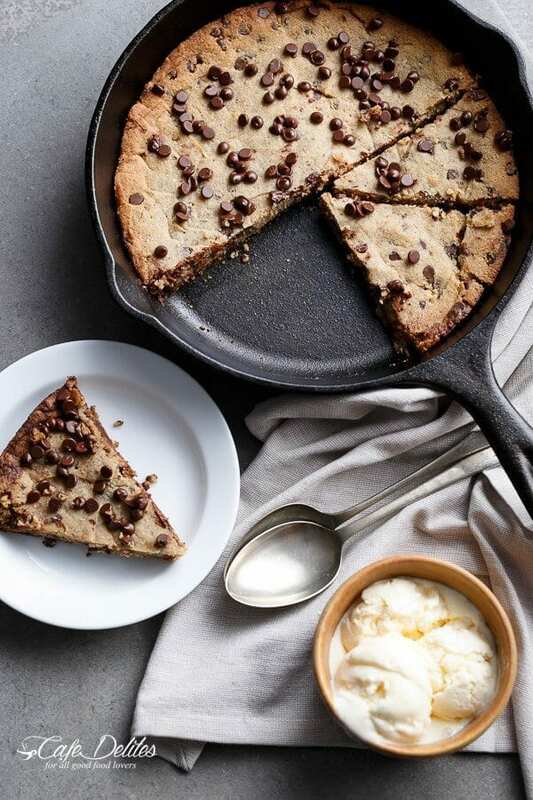 This large double chocolate chip cookie proves that good flavor doesn’t have to be sacrificed for good health. Regular flour is substituted with the almond and coconut variety, cutting out the gluten. 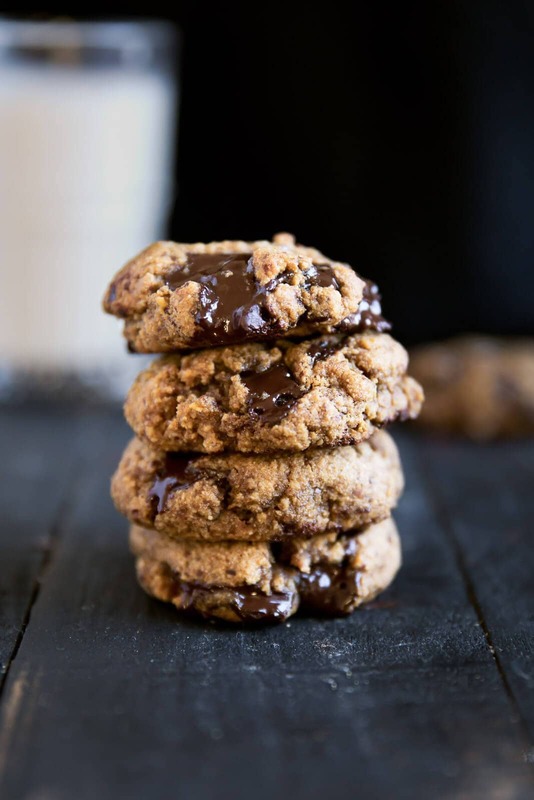 Natural almond butter adds a subtle nutty flavor to the cookie and the dark chocolate powder helps give it that beautiful brown on brown color. This paleo cookie recipe makes 8 large cookies or 16 regular ones. Welcome to the layer cake! This baking pan beauty has three layers of flavor. It’s a triple threat! The bottom cookie portion uses organic coconut sugar, almond flour and tapioca starch. Tapioca is rich in iron, which is essential for red blood cell production. In other words, this cake will really get your blood flowing. Sandwiching the middle, chocolate layer, the top layer is mouth-watering cashew butter fudge, sweetened with maple and honey. We’ve hit the trifecta! Cookie pie, my oh my! 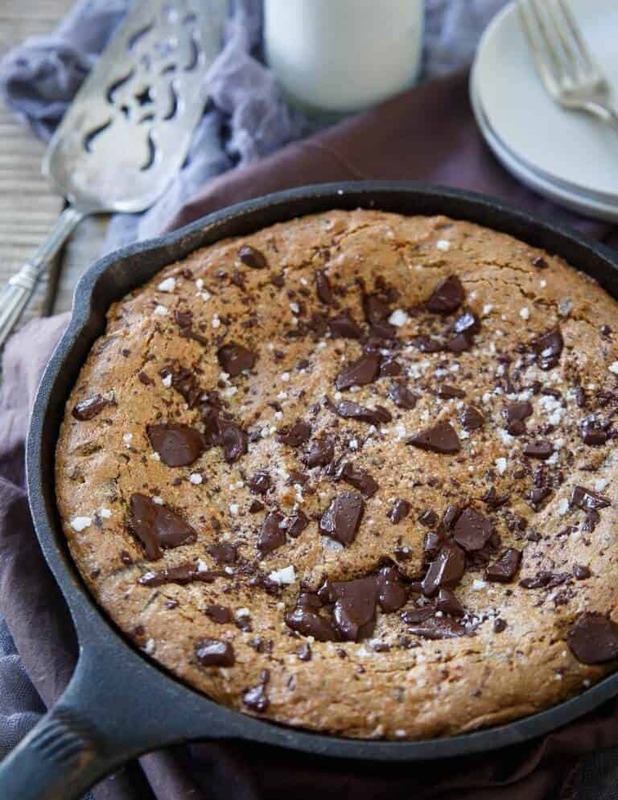 This skillet paleo cookie recipe is a sweet and salty treat. Coconut sugar balances well with the cashew butter base. Coconut sugar scores only half as high on the glycemic index as its dreaded white cousin, which helps maintain a healthy blood-sugar level. Flavonoid rich dark chocolate is chopped into large chunks and blended into the mixture. Sprinkle liberally with sea salt. You might not be able to stop at just one skillet. Why bake and mess with perfection? 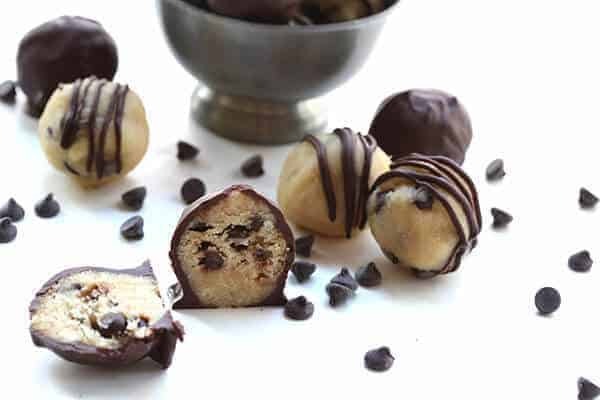 These paleo cookie dough truffles are meant to be eaten raw, as is. 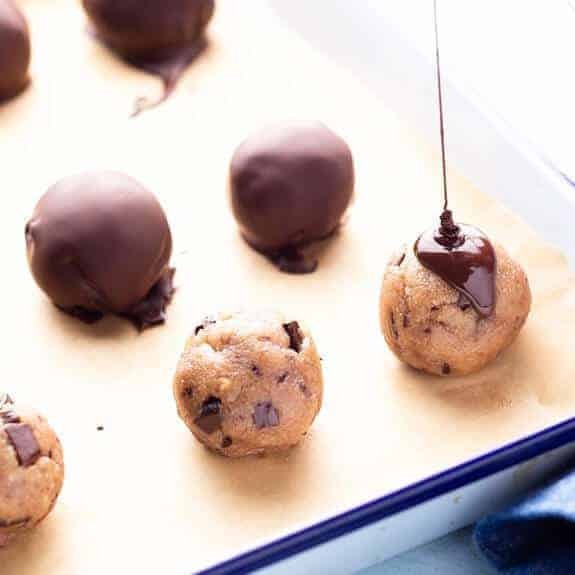 Drizzle these beautiful cookie dough balls with dark chocolate and take a bite. The almonds flower and raw butter mixture, sweetened with Swerve sugar substitute, will make you keep coming back for more. Luckily this paleo cookie recipe makes 24 bite-sized balls. No need to heat before you eat these sweets. Related to this recipe is this tasteful peanut butter protein balls. Try them too. Be careful of this addictive whitish powder! Try it just once and you might be hooked. We’re talking about coconut flour. It’s high in protein, high in fiber but low on the glycemic index and null in gluten. You’ll never want to go back to traditional all-purpose. 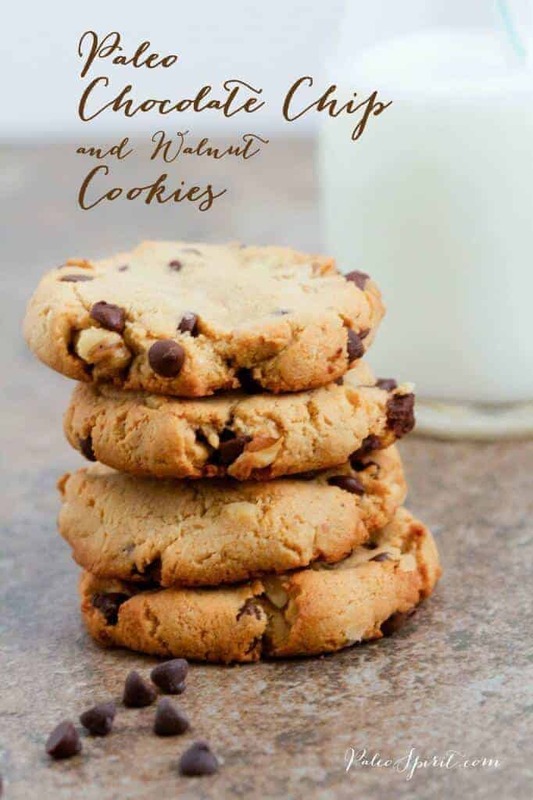 This paleo cookie recipe uses no added sugar, instead utilizing a powerful stevia, Truvia and Swerve Sweetener combination. The end result is amazing and even the most brazed cookie aficionados won’t be able to tell the difference. The first one is free. What the fudge?! This paleo cookie recipe is surprisingly good! If you go crazy for cashews, then this is a must try. These kidney-shaped nuts are great for your heart. They are loaded with fat, but don’t fret, it’s the monounsaturated kind. Skip the heat and bring on the cold. These cookies are pressed then frozen, making them the coolest cookies on the block. No oven needed. Just pop them in the freezer for a bit then get the fudge out of there. Stopping yourself from eating too many of these shortbread cookies is a tall order. 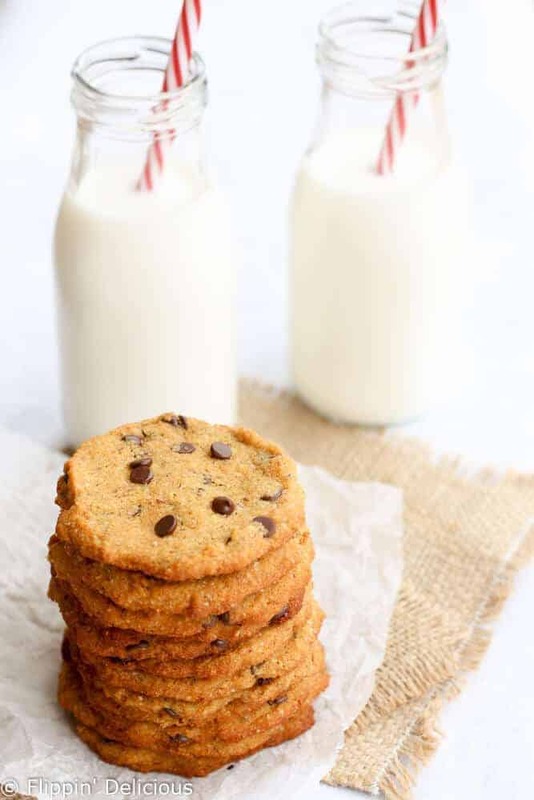 This chocolate chip cookie recipe uses unprocessed, raw cane sugar and a handful of finely chopped macadamia nuts. The phosphorus and magnesium in these nuts are great for promoting strong bone heath, which will come in handy when you try to stand up to the cravings for these cookies. These soft, buttery shortbread cookies will have you coming back again and again. 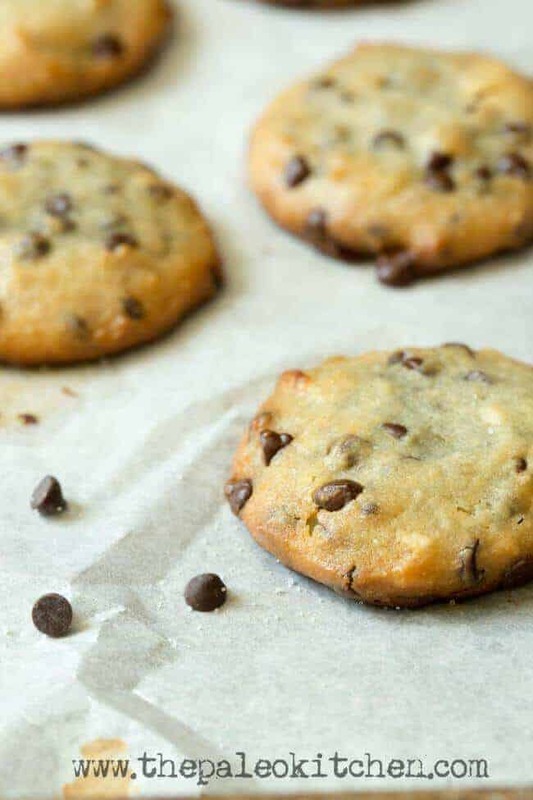 Go bananas for this simple paleo chocolate chip cookie recipe. If you can count to four then you can make these cookies, because 4 ingredients is all you need. No dairy. No eggs. No added sugar. Just gather a couple bananas, some shredded coconut, a handful of walnuts and some chocolate chips. It’s as simple as it gets. They firm up nicely in the oven and will be a surprise hit for the whole family. Who says something has to be complicated to be good. Sometimes simple is best. Go big or go home! 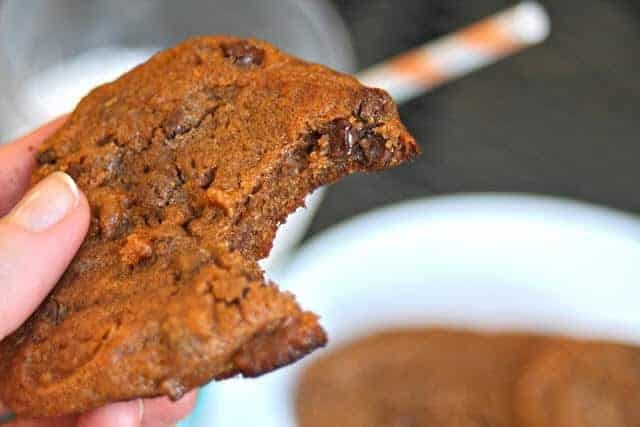 This paleo chocolate chip cookie recipe features huge chunks of dark chocolate, perfect for the chocoholics out there. The protein powered almond flour/coconut flour duo team up once again to save the day. The chocolate in these gluten free goodies just gushes in your mouth with every bit. Be careful! Any milk used with these bad boys can quickly turn into chocolate milk. Go gaga over cassava! 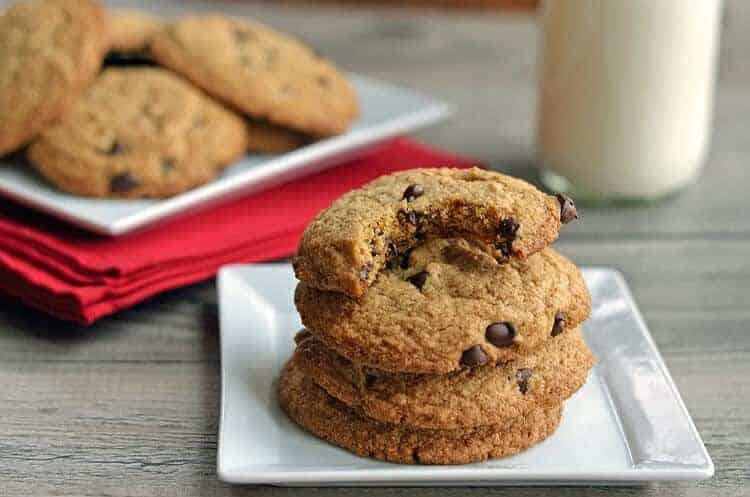 Unlike most other paleo chocolate chip cookie recipes, the base to these cookies is cassava flour. Cassava is gluten, grain and nut-free. This flour is packed with carbohydrates to give you the energy you need, and unlike other alternatives, it has a very mild taste. Cassava is probably the closest thing to wheat flour. It’s the perfect replacement! No sugar is added to this recipe. Instead it opts to utilize either honey or maple syrup and a little bit of apple sauce to give it a unique flavor. A skillet that kills it! Now this is a skillet recipe done right. This brown buttered paleo cookie recipe cooks up warm and crunchy around the edges but leaves a soft and satisfying center. Of course, this assumes it ever makes it to the over. You’ll catch yourself sneaking more than one spoonful of the delicious dough. The flavor of the almond flour base is accented with notes of vanilla and sweetened with coconut sugar and Swerve. This and sugar free ice cream makes the perfect pair. 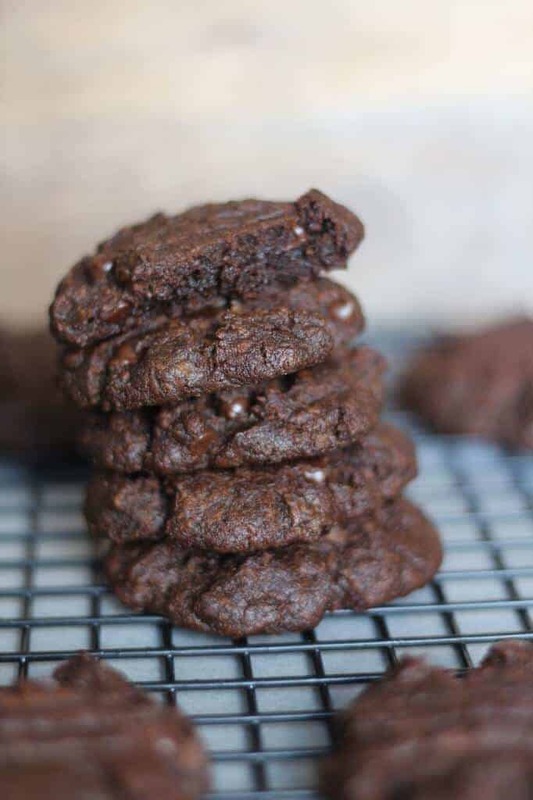 Give your jaw a workout with this seriously chewy paleo cookie recipe. 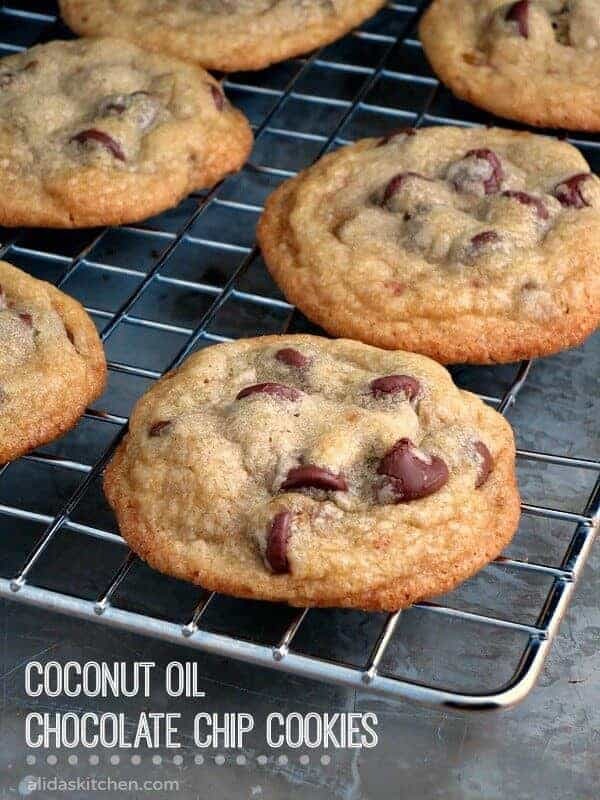 With these cookies, you can either opt for butter, or if you want to go completely dairy-free, you can substitute for coconut oil. These cookies have an almond flour base sweetened with maple syrup. But why are these cookies so chewy, you might ask? The secret is gelatin. Gelatin is great for promoting joint health, which is good, because these cookies will make you go weak in the knees. Bananas are the perfect food. Easy to hold. Easy to eat. And apparently easy to cook with too! 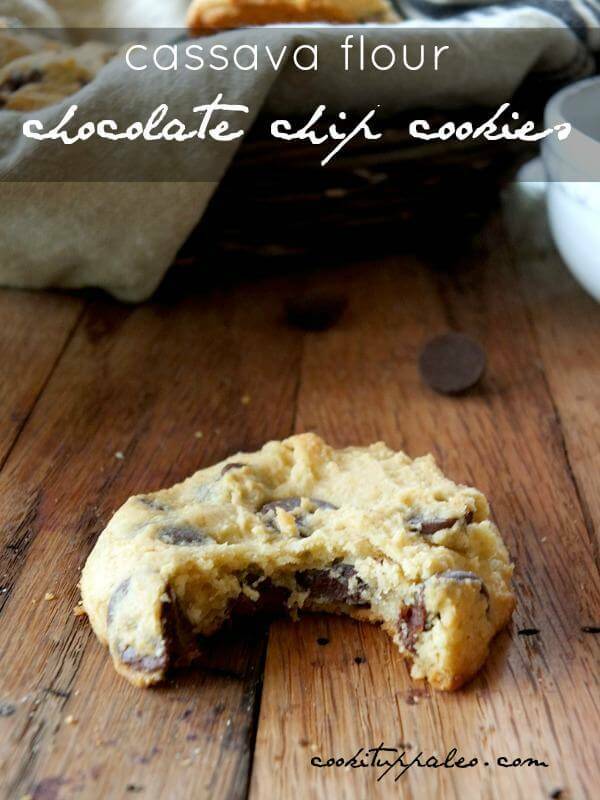 This paleo chocolate chip cookie recipe couldn’t be simpler. Bananas form a potassium rich base, with a little coconut flower and cashew butter thrown in to up the protein content. Now just add some sweetener and some chocolate chips and voila! You can count the amount of ingredients used in this recipe on one hand, but you’ll be eating these cookies with both. 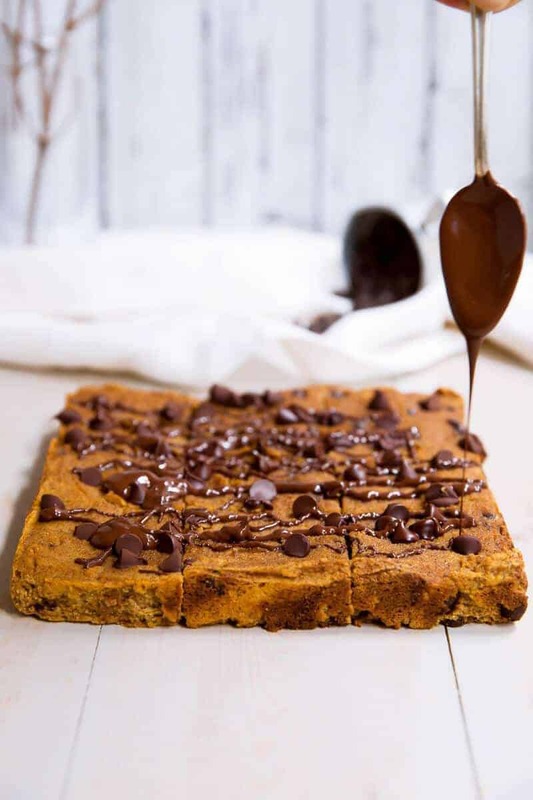 Perfect for Halloween time or anytime, this paleo chocolate chip cookie recipe is scarily good. Coconut flour and maple syrup make a tried and true base, and pumpkin and spices make special guest appearances in this recipe. Pumpkin, high in vitamin A, is extremely helpful for maintaining healthy eyesight. So see how good these are for yourself. Carve into a pumpkin bar! 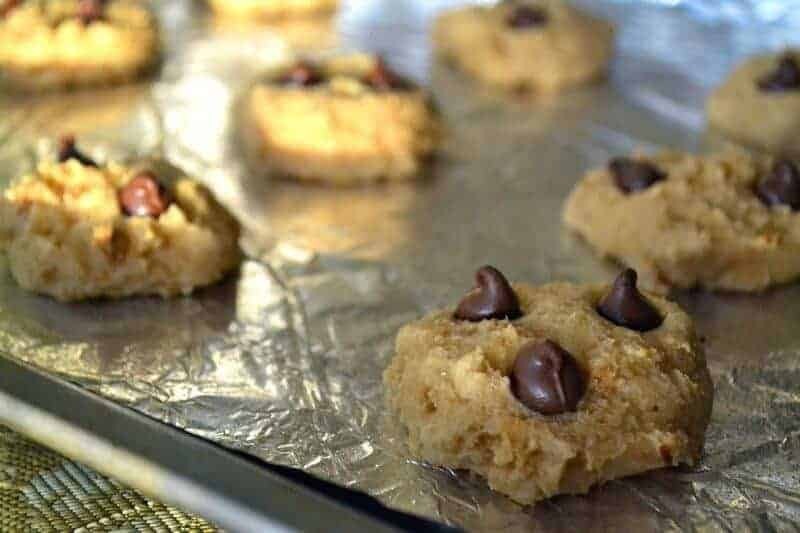 Turn bad bananas into good cookies with this cookie recipe. The chopped cashews in this cookie give a satisfying crunch, and overripe banana insure that they will be unbelievably soft. Don’t let a black banana ruin your day. After all, a banana might be shaped like a frown, but it can also look like a smile, depending on your perception. Skip the flour with these flourless peanut butter cookies. Peanut butter is as full of nutrients as it is of flavor, and this flavor really pops without the flour. The high fiber and protein contents in these cookies are the keys to satiation. They will keep you full all day, except for the occasional extra cookie you sneak here and there. 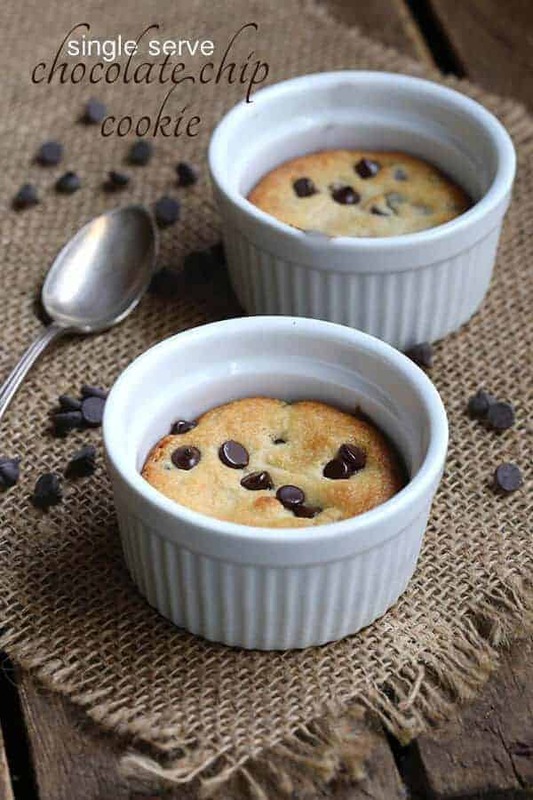 A cookie in a cup! The best thing to happen to a mug since coffee. Prepare to fall in love with your microwave all over again. 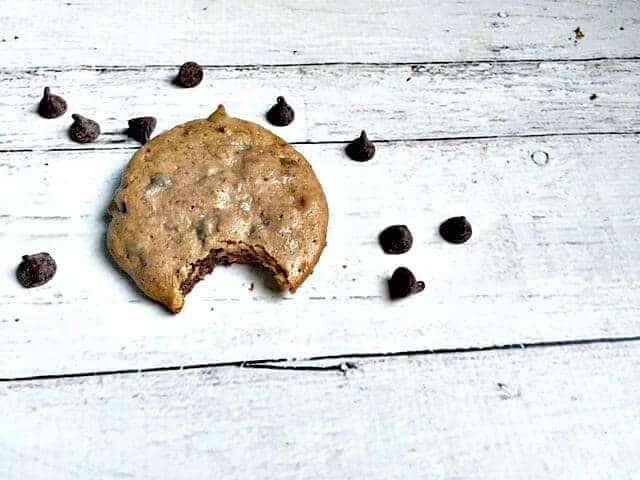 This personal sized paleo chocolate chip cookie is perfect for those with self-restraint problems, i.e. cookie addicts. You can’t over eat if you only make one. 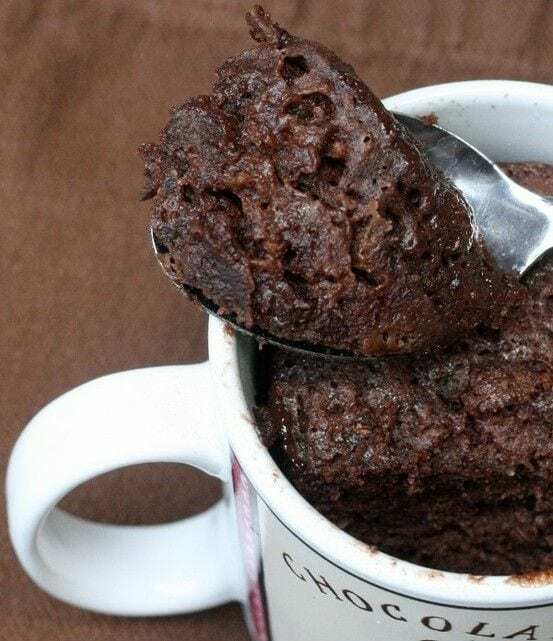 The entire recipe is made right there in the cup, with the help of a spoon and a microwave. This makes cleanup a breeze. No muss, no fuss. No mess, no stress. Living the chocolate dream! Chocolate chips and powder combine in this overload of goodness. But what is chocolate without a little bit of vanilla? If that’s not enough, peanut butter is thrown into the mix, and hey, why not, let’s toss in some applesauce too. If an apple a day keeps the doctor away, then you’ll have the healthiest family on the block. All these ingredients combine to form a cookie so good that you’ll see them in your sleep! 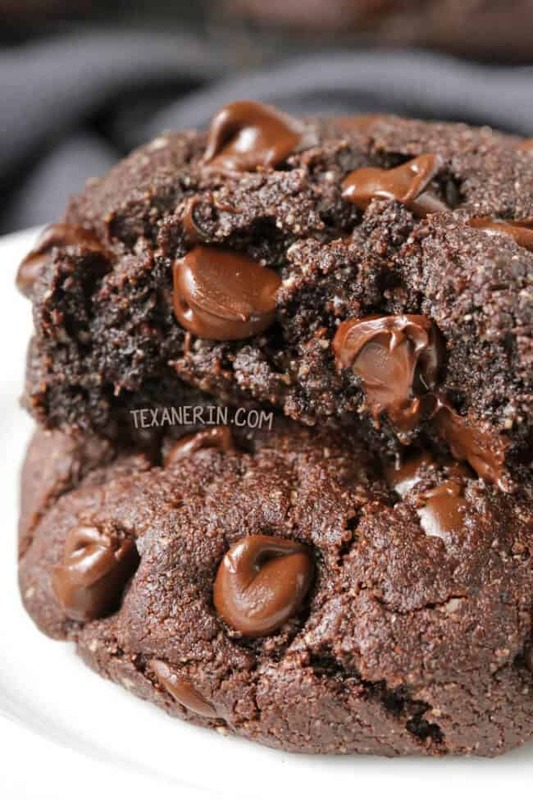 Paleo chocolate chip cookie recipes don’t come along like this often. Disclaimer: No animals were harmed in the making of this cookie. That’s right! These are 100% vegan. Like many paleo foods, these cookies don’t use any animal byproducts. These giant cookies are a handful and can easily serve 2 people each. These animal friendly treats contain milled flax seeds, which are rich in omega-3 fatty acids. This is great for your skin, so after eating these, both your conscious and your complexion will be clear. Not nutty but still crazy good. These nut free, low carb paleo chocolate chip cookie scones are the perfect coffee companion. High in protein and healthy fats, these cookies will keep you satisfied all day long. The breakfast cookie. The soft center soaks up all that brewed caffeinated goodness. Psyllium husk powder is loaded with fiber, so combined with your favorite cup of joe, it will really get things moving in the morning. You won’t be able to leave these scones alone. Start your day of right with these paleo chocolate chip breakfast cookies. No kid will refuse these treats on their way to school. These cookies are a sneaky way to make sure the kids eat a complete breakfast. These cookies have an almond and coconut flour base, and several types of nuts are used, giving a wonderful medley of flavor. Honey, with its natural antibacterial properties, does the double duty of not only sweetening the pot, but it also help keep the kids well enough to make it to class. These paleo prizes require patience, but the payoff is priceless. 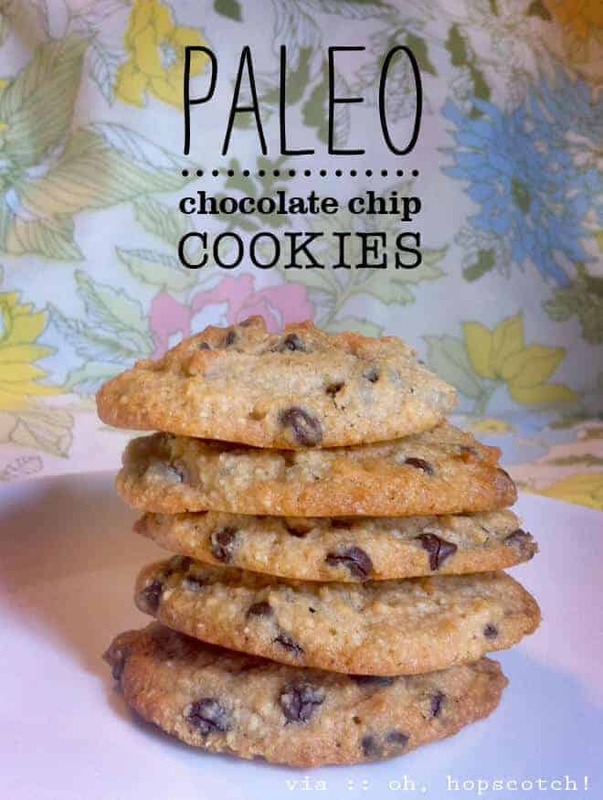 If you have some time to kill, mix up a batch of these paleo chocolate chip cookies. They have an almond flour base and are sweetened with maple syrup and vanilla. A little sea salt is thrown in to balance out the rich chocolate chips. They are well worth the wait. 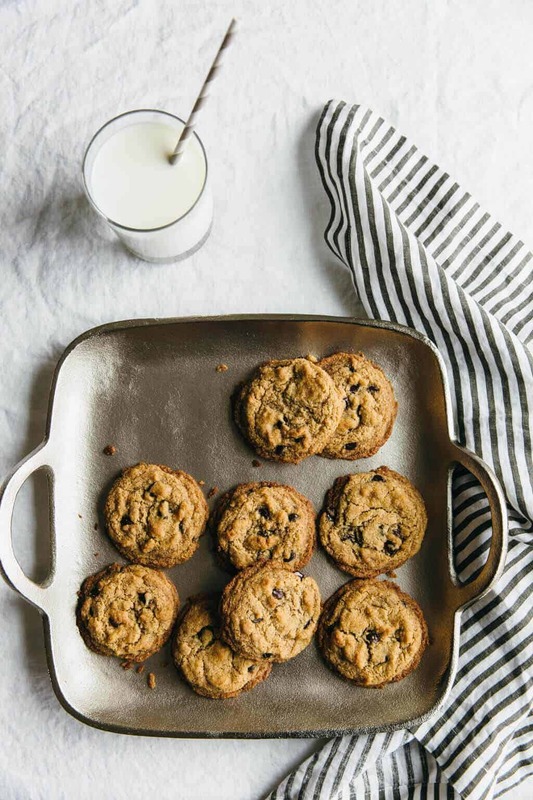 These paleo chocolate chip cookies are so good that they just might be the best. 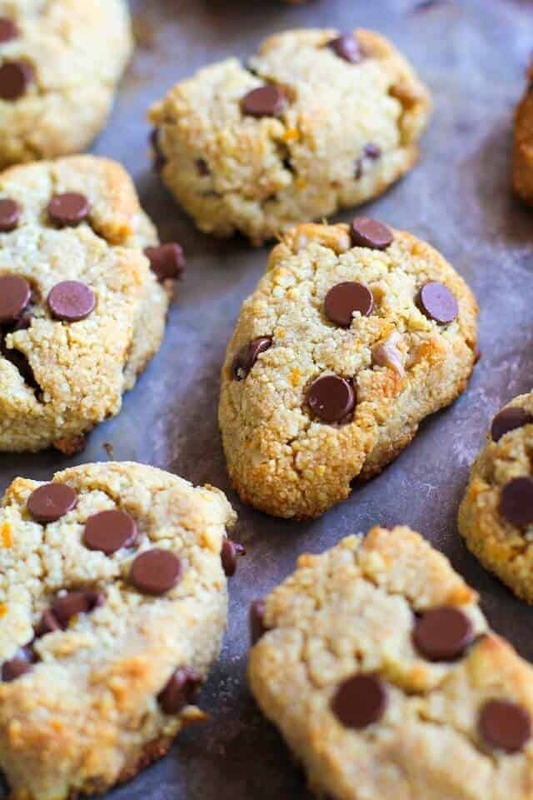 If you’re tired of dry, flaky paleo cookies, then these are an eye-opener. After fully blending the ingredients together, these flatten nicely in the oven, leaving a soft and evenly baked cookie. 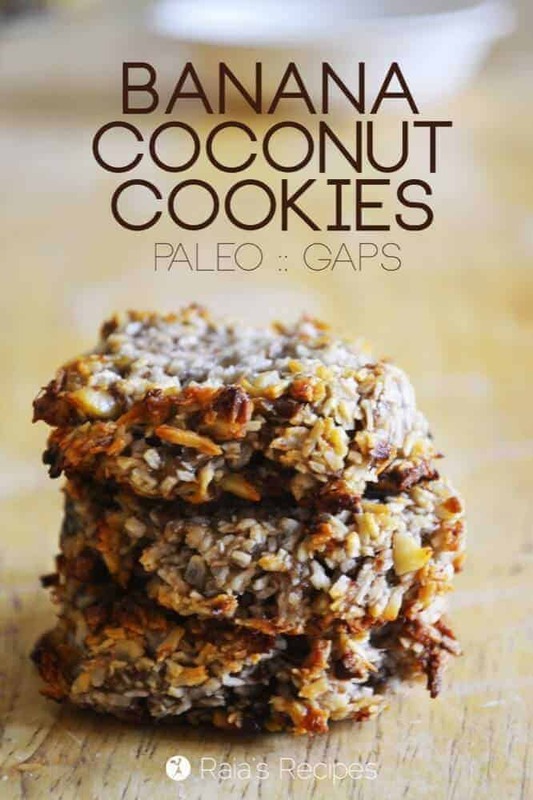 Coconuts really play a hand in this paleo cookie recipe. Coconut milk, oil and sugar are all used. If you have to try just one, try the best! All hail the almighty almond. Almonds are a great source of vitamin E, which has been shown to reduce the risk of heart disease and cancer. Just one ounce of this miracle nut has about a third of the recommended daily intake of the vitamin. 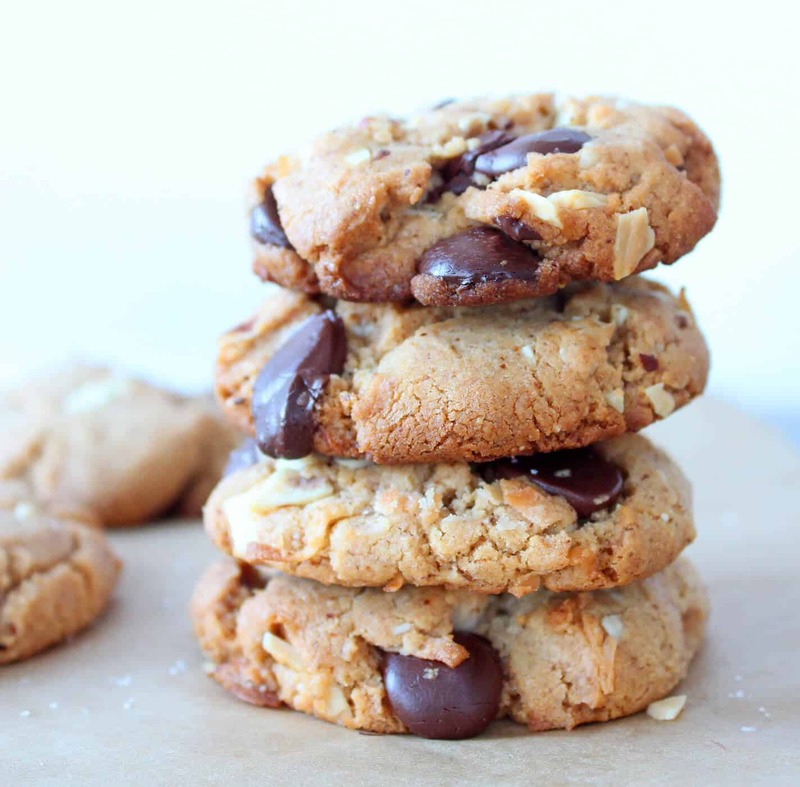 This cookie recipe features both almond butter and actual large almond pieces. These nuts add a nice crunch to the otherwise soft and chewy cookie. It’s a great option for all you nut lovers out there! We could all use a little extra zest in our lives! 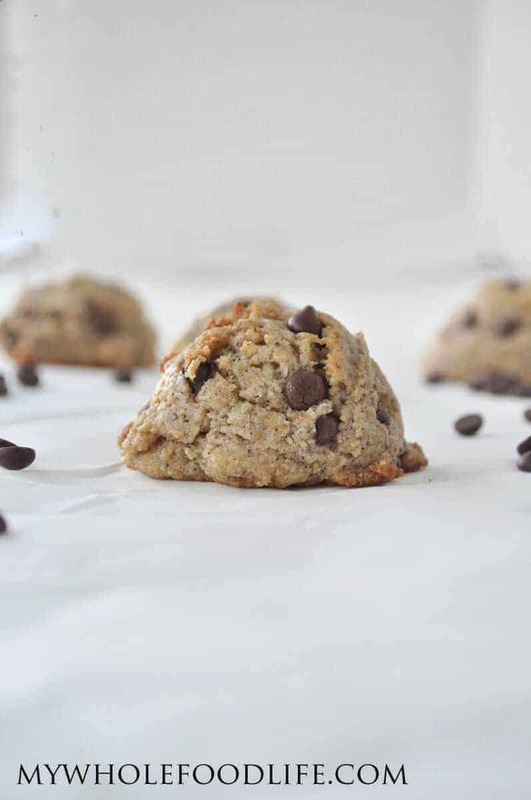 These paleo chocolate chip cookie scones have a pair of unique ingredients. Who knew that orange zest and ginger would go so well in a cookie? These ingredients blend well into a great medley of flavor. A staple in Chinese medicine, ginger has long been known for curative properties. It is an anti-inflammatory, it lowers cholesterol and blood sugar, improves brain function, the list goes on and on. Ginger can even help to ease morning sickness, which is another reason these scones pair so well with your morning cup of coffee. For all you cookie monsters out there, this paleo cookie recipe makes a batch of 14. Eat two a day for a week, or let it all hang loose and finish them in an afternoon. The choice is yours. These cookies have a coconut flower base mixed with almond butter. Both ingredients are jam packed with protein, which not only fill you up and keep you feeling satisfied all day, protein also helps promote muscle growth. Paleo foods can be very easy to prepare. With a little practice, you can go from scratch to cookie in just about 20 minutes. This single jumbo cookie recipe is perfect for those out there who worry about overindulging. But don’t worry, with a cookie this big, one is all you need. It has an almond flour base with a little vanilla thrown in for taste and sweetened with coconut sugar. The end result is gigantic and fantastic. Goes well with your favorite milk…if you can fit it in the glass. Bring balance to your life, and your diet, with these yin yang cookies. These two-toned treats are made with a combination of almond, coconut and tapioca flours and sweetened with maple syrup. If chocolate chips aren’t enough, one half of the cookie is glazed in chocolate and sprinkled with coconut, giving it its distinctive look. Achieve inner-peace with these little pieces of heaven. They are the enlightened choice. High protein and half baked! These cookies strike the perfect balance between cookie and dough for those out there who can’t decide which one they like better. 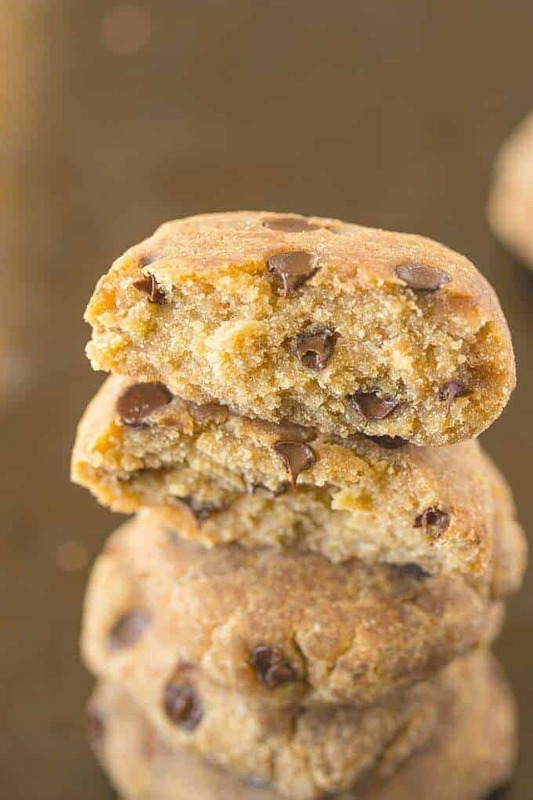 Utilizing a few scoops of vanilla flavored protein, these paleo chocolate chip cookies make a great after workout companion. The coconut flour base and peanut butter add to the mix, resulting in 5 grams of protein per cookie. A little applesauce adds a hint of sweet tartness to the recipe and helps set this one apart. See also: Delicious white-chocolate raspberry cups for your delight. One extra ingredient can make all the difference. 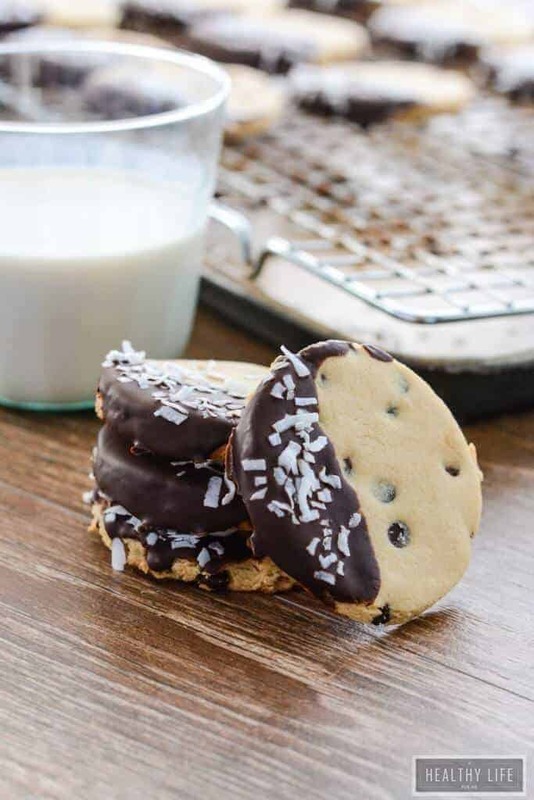 This cookie recipe it kicked up a notch with the coconut oil inclusion. Coconut oil is filled with healthy fatty-acids and tastes amazing to boot. Dark brown sugar, dripping with molasses, adds a deep richness to this chewy cookie’s profile. Try one and you’ll be hooked! 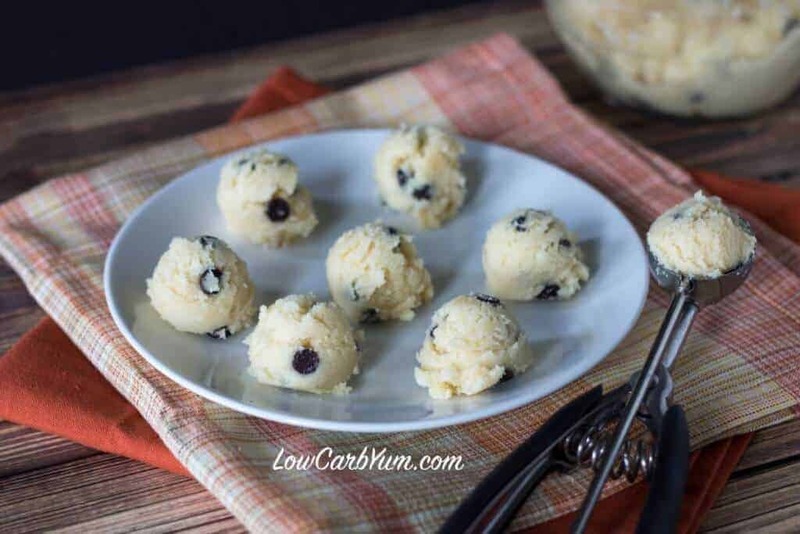 Macadamia fat bombs of flavor! This paleo cookie recipe packs a one-two macadamia punch, using both whole nuts and oil. Added to the mix is your choice of either ground coconut or almond meal as a base. This combination results in a cookie that practically drips with monounsaturated fatty goodness. No flour or butter is needed and the end result is amazing. Beautiful double-baked biscotti! 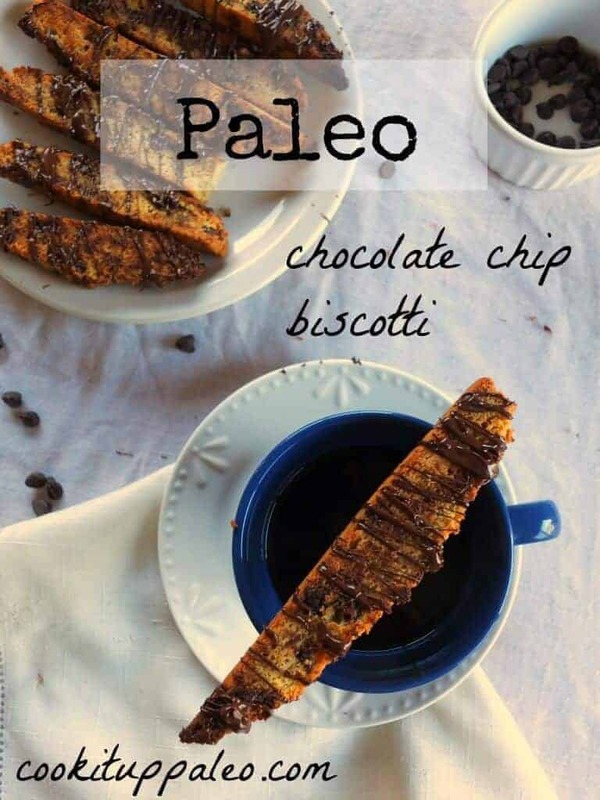 This paleo biscotti is at first baked like a cake When you’re done with round one, these cookies are sliced into strips and then tossed in the oven a second time, ensuring a satisfying crunchy outer layer. These stiff cookie bread sticks have a coconut flour/almond flour base and are sweetened with pure maple syrup. After a quick drizzle of chocolate, they are ready for your morning coffee cup. Grab a loaf pan and a large appetite, these cold prepare cookies are coming your way. With no oven necessary, this paleo cookie recipe couldn’t be simpler to prepare. There are no eggs, so there are no worries about eating this one raw. 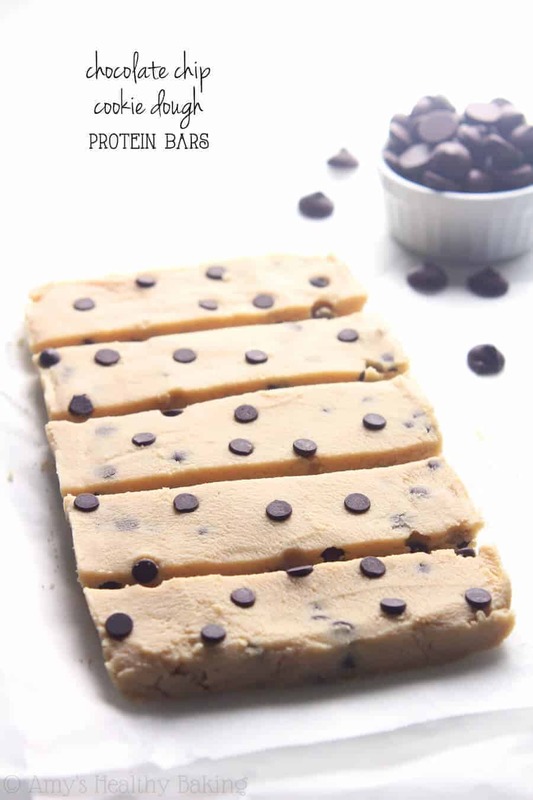 These cookie dough power bars have a coconut flour base with soy protein mixed in. The soy really ups the protein content in these bars, making them a great option for an after gym recovery snack. But don’t just wait for your post-workout, these bars are good anytime. If variety is the spice of life, then these 50 recipes offer a lot of living. 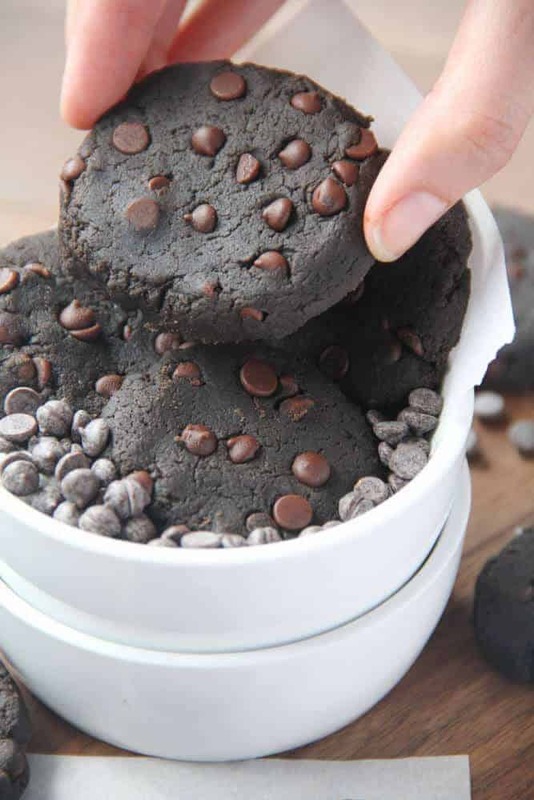 These recipes prove that eating healthy doesn’t have to mean eating blandly, and these food restriction friendly cookies means that nobody has to miss out on the joys that cookies bring. 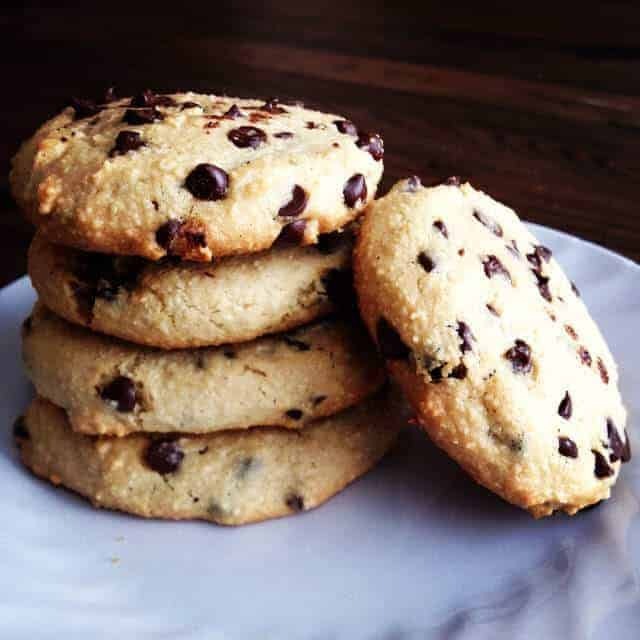 These paleo cookie recipes combine healthy fats and protein with tasty goodness, showing that function can meet flavor. The health benefits in the high quality ingredients used will keep you living better and longer. 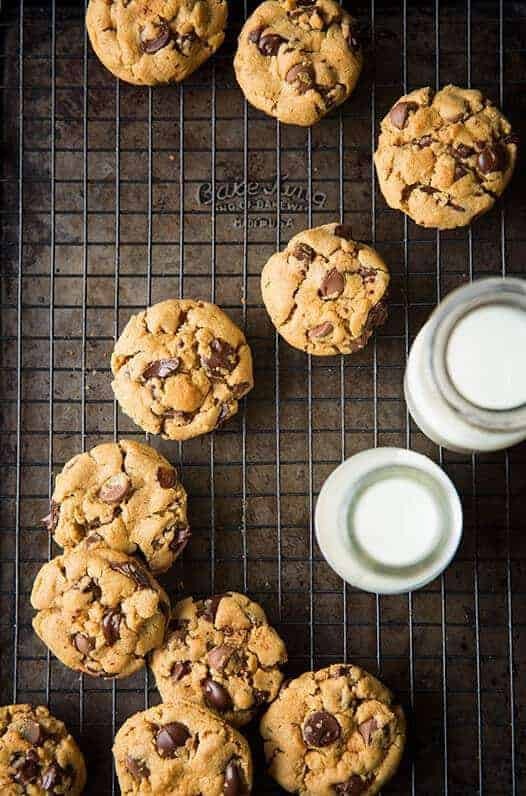 A longer life means, you guessed it, more cookies, so turn on the oven and pour yourself a glass of your favorite milk!